Client Lifecycle Management- What Should a Single Integrated Solution cover? A well-designed and fully-integrated Client Lifecycle Management (CLM) solution has the ability to transform client relationships whilst empowering Wealth Managers to maximize the potential of technology and withstand future regulatory changes. Wealth Dynamix has seen its international expansion continue apace, with the recent opening of the New York and Toronto offices. Welcoming Kevin Jennings and Chad Jennings to Wealth Dynamix who both previously worked at Boston Consulting Group’s subsidiary, Expand Research, a leading provider of competitive analysis for financial services. Wealth Dynamix and ELCA, one of the largest independent Swiss Consultancy firms have partnered to drive digitization in the Private Banking sector in Switzerland. This new partnership will enable ELCA to offer its customers a solution designed to deliver specific business outcomes around client acquisition, client management and onboarding. 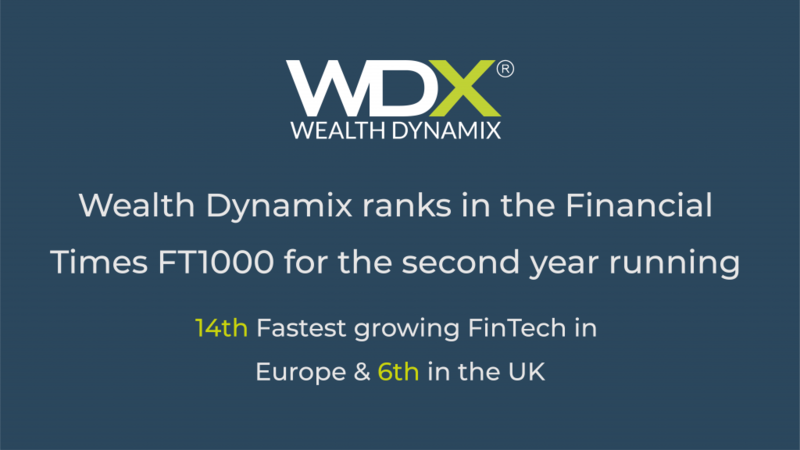 Wealth Dynamix announces its recent ranking in the Financial Times FT 1000, the complete list of Europe’s fastest-growing companies. The firm was named the 5th fastest growing Fintech Company with an impressive 1,500 +% revenue growth over a 4-year period. The General Data Protection Regulation (GDPR) will come into force on 25 May, with the aim of prompting a paradigm shift in the way we think about data, and how it is attained, managed, processed and erased. In a world of unprecedented disruption, the battle for the client has intensified. Yet as the wealth management sector comes to terms with this changing landscape, the client is fast evolving – at the risk of outpacing much of the wider industry. WDX have been recognised as a representative provider by Gartner for two of their Banker’s guides: Banker’s Guide to Wealth Management Front-Office Systems and Banker’s Guide to Wealth Management Mid- and Back-Office Systems. Money is moving. Unprecedented global uncertainty coupled with the increasingly international nature of high net worth individuals themselves mean that the world’s wealth is constantly shifting. We have long been warned that there are two certainties in life – death and taxes. However, as the technological revolution has unfolded, a new certainty has emerged: digitisation. It is fair to say that change has become the norm within financial services today. The last few years have seen businesses invest on multiple levels in understanding the steady stream of regulation we face and then adjusting their propositions and processes to ensure they comply with this. For any firm in the Wealth and Investment Management industry that make their services available via intermediary partners, there is an ongoing effort to drive business with a broader range of firms, and extend relationships further into existing networks. WDX have partnered with FCA authorised firm, Thornbridge Investment Management LLP, as part of an ongoing effort to ensure suitability and conduct risk guidelines are met across their best practice product, WDX ONE, in line with the changing regulations in the industry. At its core, onboarding is the process of ﬁnalising a new relationship with a prospective client. For wealth and investment management ﬁrms, the value proposition for leveraging cloud technology affects the entire business. As the Wealth Management industry continues to advance and integrate new technology, cloud technology has developed as a primary enabler for growing firms to deal with increased regulatory pressure and a demanding client base. The recent advancements in technology has meant that most firms have started to acquire a more digital approach in their business outlook, however, going ‘digital’ has different meanings for some managers. In wealth management today, technology is used to compliment customer service but finding the right balance is no easy feat. Since the votes came in and it was announced that Britain has decided to leave the EU, the country has been in a state of shock. Cloud computing – what does this form of technology mean for the wealth management industry? We are delighted to annouce that Wealth Dynamix will feature in the inaugural Sunday Times Sage Start-up Track 15, published in The Start-up List 2015 magazine on 15th November 2015, in the Sunday Times digital edition, and on our website from Sunday. A firm focusing on CRM systems in wealth management is celebrating a lot of achievements. Are wealth managers risking technology exclusion? The Challenge of Embracing New Technology – Are UK Investment Firms Risking Technological Exclusion? Only 25% of wealth management firms had conducted serious conduct risk assessments and only 15% had actually evolved an IT-related strategy to address the issues. Our ground breaking Breakfast Briefing, “Harnessing Technology To Tackle Conduct Risk” was a great success. UK regulations about what is called “conduct risk” are driving important innovation in the country’s banking and wealth management industry. Brent Randall joined other members in the industry to discuss various current topics that wealth managers are facing. Pulse and Wealth Dynamix have announced a joint venture to allow Pulse to enhance its offering to clients through the introduction of a powerful CRM solution. Wealth Dynamix, provider of wealth management CRM software solutions, has announced that Quilter, the specialist private client wealth management business, has been using its consulting group to deliver the Microsoft Dynamics CRM solution for its UK client operations.